Note to self: Avoid flying knees from Michael “Venom” Page at all costs. Evangelista “Cyborg” Santos (pictured) clearly didn’t get the memo in time. 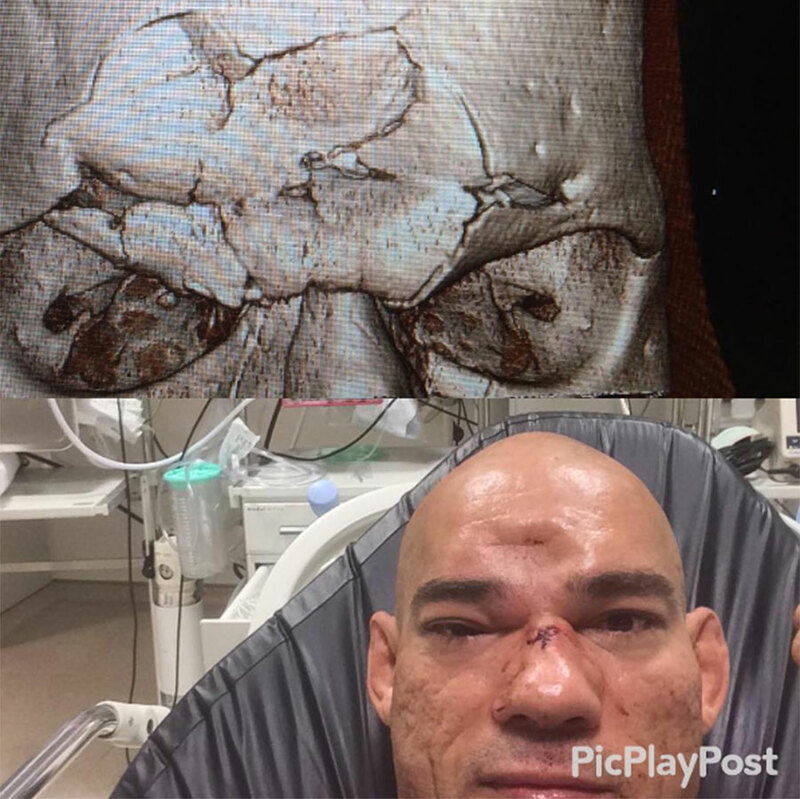 Santos, the ex-husband of Invicta FC featherweight champion Cris “Cyborg” Justino, suffered a fractured skull courtesy of a perfectly placed and timed flying knee from Page in Saturday’s knockout loss at Bellator 158 inside the O2 Arena in London. Justino posted the above pic on her Instagram account asking for the MMA community to pray for her ex-husband’s recovery. Santos is expected to undergo surgery as soon as doctors feel it is safe for him to fly back to America in order to do so. According to Justino’s post, Bellator will cover all of Santos’ medical bills. Bellator color commentator Jimmy Smith was told this type of injury is normally suffered in a severe car accident. Veteran referee “Big” John McCarthy, the third man inside the cage when Page unleashed his highlight reel strike on Santos, said it was the hardest knee he had ever witnessed in a fight. McCarthy likened the sound to a baseball bat smacking a ball out of the ballpark. On the flipside of this gruesome injury is the fact Page’s legend continues to grow. “MVP” now owns a perfect 11-0 resume, finishing off all but one of his victims before the final horn. For you UFC fans wondering, Page reportedly has four fights remaining on his Bellator contract.